777 Casino is the novelty of 2015 in the on-line gambling business. It is part of the 888 Holding Casino group and it has a gambling license from Gibraltar and UK gambling authorities. The vintage atmosphere of the 50s in Vegas is the chosen design theme for the 777 Casino. The light colors of the blue sky, the Nevada Desert, and the smooth details of the vintage cabriolet, casino billboard, bright lights and the silhouette of the most notable gambling place on Earth capture the essence of Las Vegas. Heads to toes, everything is well thought through. The theme is complete with the vintage illustrations for game categories, the logo and the fonts used. The games are organised in straightforward categories that are easy to find and navigate. Customers that are not ready to commit with real money from the beginning can try the casino games with the £21 no deposit bonus. The security of the website is top of the class. A random number generator offered by eCOGRA and a strong security system for the data protection are part of the security system that guarantees a secure gambling experience. The NetEnt software developer provides all the games available at 777 Casino. Some of the most popular slots or progressives of the moment, both retro inspired, with three reels, fruits symbols, and most complex five reel video slots are waiting to be played. Starburst, Millionaire Genie, Rainbow Riches,Irish Riches, Twin Spin, Dazzle me, Jack and the Beanstalk are just some of the items on the hits list. For the casino games players, the offer includes baccarat, blackjack, roulette, together with many other traditional table games. The seekers of an authentic casino experience broadcast by live dealers have the live casino games tab with live roulette and live blackjack available. The first bonu s offered is the no deposit bonus that values £21. It is granted upon registration to players from United Kingdom, Germany, Austria, Sweden and Canada and has to be activated within 48 hours. The welcome bonus is 100% up to $100, but it can be activated with a deposit as low as $20. The activation code is 1LUCKY7, and it has to be wagered 30 times. The cash can be used for bets at any game from the website. For the next four additional reloads, all players are given 30% up to $350. 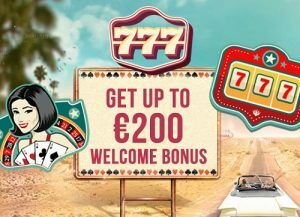 The bonuses are activated with the same codes: 2LUCKY7, 3LUCKY7, 4LUCKY7 and 5LUCKY7. The terms and conditions are the same as for the initial deposit. The minimum sum that activate the reload bonuses is $20. The on-line casino also has a daily offer that give free credits, extra cash, cash back or other prizes. The website is mobile responsive. It uses a dynamic interface that resizes and removes elements depending on the platform you use for visualization. The games can be played from all the smartphones and tablets running the Apple, Android, Windows or Blackberry system. The deposit and withdrawal methods include Visa, credit and debit cards, Skrill, Neteller, Paypal, EntroPay, WebMoney, Boleto, eKonto, Giropay, iDeal, POLi, PaySafeCard, bank transfer, fast bank transfer, and many others. From your account at 777 Casino you can choose different methods, depending on your location. The minimum deposit and withdrawal is $10. Deposits, except the bank transfer, appear instantly into your account’s balance, while withdrawals may take from two to seven business days, depending on the method. Clients from UK, Germany and Sweden have dedicated toll free phone lines to contact the customer support at any time of the day. The e-mail service is guaranteed to reply within 24 hours.